The Belt and Road Initiative, due to its diverse and extensive infrastructure investments, poses a wide range of environmental risks. Some projects have easily identifiable and measurable impacts, such as energy projects' greenhouse gas emissions. Others, such as transportation infrastructure, due to their vast geographic reach, generate more complex and potentially more extensive environmental risks. The proposed Belt and Road Initiative rail and road investments have stimulated concerns because of the history of significant negative environmental impacts from large-scale transportation projects across the globe. 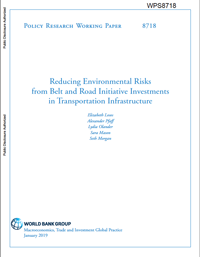 This paper studies environmental risks—direct and indirect—from Belt and Road Initiative transportation projects and the mitigation strategies and policies to address them. The paper concludes with a recommendation on how to take advantage of the scale of the Belt and Road Initiative to address these concerns in a way not typically available to stand-alone projects. In short, this scale motivates and permits early integrated development and conservation planning.